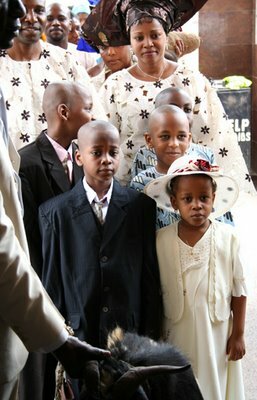 We went to our neighbour's christening recently at the nearby Catholic church. For the first time in Nigeria, I found the sermon moving and meaningful - it was on Job and the nature of suffering. Rather than the hard-sell of immediate wealth and brutal destruction of one's enemies, a la the pseudo-Christianity of the motormouth pastors, the priest spoke of the necessity to accept suffering, both personally and for others. He said that when one is next to someone suffering, it is often better to sit silently with them than to coat the moment in candyfloss (he didn't quite say it that way but you get the point). Although it was a Catholic church, this message strikes to the absolute core of my faith (if it is that) in the Buddhist message: embracing the necessity of suffering, rather than running away from it. 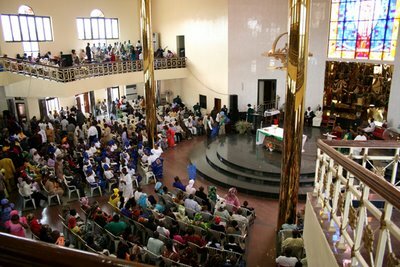 I do enjoy the colour and ritual of the Catholic church - especially in Africa. On the day, the music alternated between the drone-like latinisms of the priestly voice with lilting African melodious choral works. If only they'd change their tune on contraception! It looks like it was a lovely christening. maybe you've been going to the "wrong" churches up till now. I've often heard sermons like this, thoughtful, deep, and inspiring, in Nigerian churches. The loudest voices are not always the steadiest or most consistent ones. Eight years ago, I suffered from a severe bout of what I think was rheumatic fever. The doctors couldn’t diagnose what exactly was wrong with me, having earlier treated me for malaria. All sorts of medical tests imaginable were carried out. But each time, the family doctor kept saying that I was perfectly okay. He requested that I spend more time resting. Physically, I looked okay. But walking was something I dreaded because of the immense pain I felt in my legs and joints. I had always been a religious/spiritual person and wondered if my faith could offer any explanation as to why this was happening to me. I envied most people I met and fell into self-pity. Why me? Why me? I kept asking. As a Catholic, my faith was centered on the need to accept pain and difficulties in life. But putting this into practice wasn’t easy. I read about the lives of the saints and how quite a number of them suffered in this world. My suffering didn’t make me any more religious or spiritual. It however made me question the core articles of my beliefs. Eventually, I decided to accept my situation and get on with my life. Yes, I was in pain but self-pity appeared to be doing more harm than good. I hid the pain from everyone (except my immediate family) and outwardly, appeared to be leading a normal life. I found myself writing songs to describe my condition and wondering what the future might hold. At Mass, I listened to sermons which described suffering not as something evil but as a condition we all have to face in this imperfect world. However, when discussing about suffering with my Pentecostal friends (without making any mention of my condition), they told me that suffering could be cast out because Christ never intended for his followers to suffer. I never quite fell for the Pentecostal view on suffering. I found it a bit out of touch with reality. Within a year, the pain began disappearing and a year after that, I was back to my good old self. A few years later, I had a medical test, which showed that I was in good health. Today, I am in ‘great’ physical health. Suffering, in my opinion, is a part of being in this world. We should not run away from it but accept it in whatever way it comes. Suffering refines us and could aid in purifying our lives. My faith did help in putting a lot of this in perspective. I am glad you found something beneficial in the sermon at the christening. If only they'd change their tune on contraception! As if that would change anything for you. You'll find there's a lot less nonsense in the orthodox churches than in all the pentecostal claptrap thats spouted in these new churches. yes jeremy you are right, i love how the catholic church in nigeria is able to alternate between joyous and raucous moments and joyous and solemn moments. i love how God is there in the most silent of moments and in the noisiest environments, and how homilies will tell you that pursuit of happiness is to be found in far more than material wealth...the ability to find God in joyous handclapping is sadly absent here in a lot of catholic churces in the US. sigh.